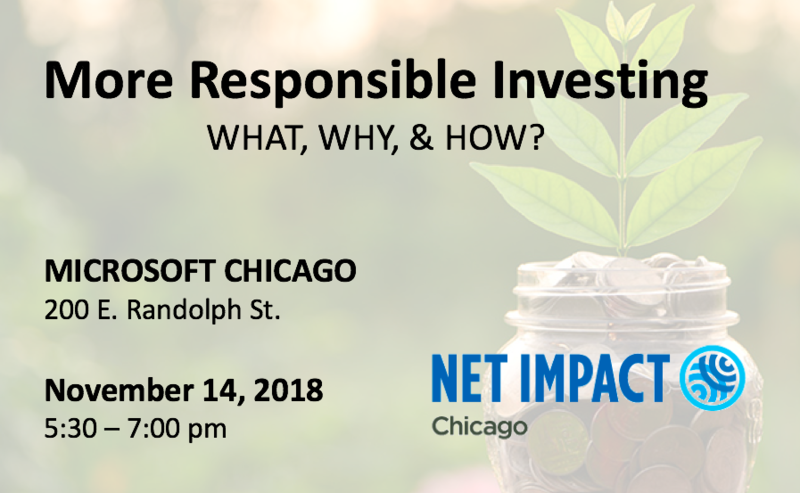 Net Impact Chicago - More Responsible Investing - What, Why, & How? More Responsible Investing - What, Why, & How? Microsoft Chicago - 200 E. Randolph Street. Join the Net Impact Chicago Professional Chapter (NIC) at Microsoft's Downtown Chicago offices on Wednesday November 14 for a panel discussion and refreshments with leaders in the field of impact investing to learn about making investments that align with your values. What do we mean by"more responsible" investing? Why should you consider doing it? Can you even do it if you are not a wealthy household or trust? If so, how? Matthew Blume, CFA,Director of ESG (Environmental/Social/Governance) Research - Appleseed Fund. Khloe Karova, CFP, Founder, Modern Capital Concepts. Sylvia Panek, AIF, Advisor, Natural Investments. Registration includes light food and beverages. RSVP soon as space is limited! Please also note that building security may require photo ID for entry to the venue. Disclaimer: This panel presentation and all related contents and materials are views expressed by the speakers and not solicitations to buy or sell particular investments nor the official recommendations of event conveners nor of the venue hosts. Before acting on information from this discussion, attendees should consider whether it is suitable for their particular circumstances and strongly consider seeking advice from their own financial or investment advisors.